This course, intended for students not majoring in biology, provides a broad survey of plant biology. Students will be able to recognize major plant groups and their characteristics, describe plant structure and its relationship to plant function, and associate the survival of plants with expression of genes controlling plant function. The course includes a lab section and satisfies university lab course requirements. Offered every Spring/Fall. Fall 2018 Syllabus. This course will cover the fundamentals of plant physiological processes at multiple scales, from the cellular to whole-plant level. The class will consider physiological responses to a variety of abiotic and biotic conditions across space and time, including responses to expected future global changes. We will examine plant strategies that influence their form, function, and distribution. The course will consider both natural and agricultural contexts. Students will tackle classical literature as well as current topics in plant physiology. Classes will be primarily discussion based. Offered Spring of odd-numbered years. 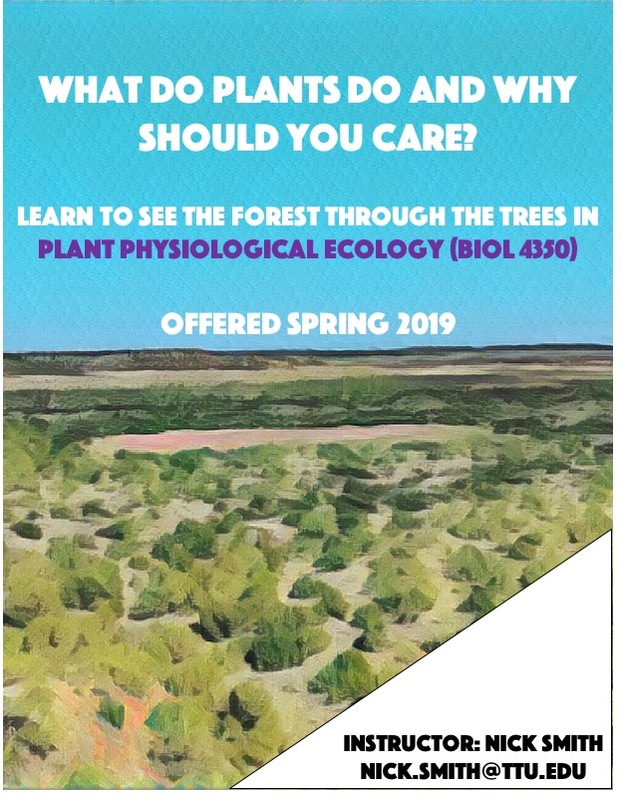 Information and material for the Spring 2019 course can be found on the course GitHub repository. As part of this research experience, undergraduates will learn research techniques under the supervision of Nick Smith and members of the Smith lab. As a final project, students will develop a proposal for a research project that will (ideally) take place in a following semester. Projects may involve, but are not limited to, laboratory, greenhouse, field, and/or computer simulations. Offered every semester. Fall 2018 Syllabus. As part of this research experience, undergraduates will design and carry out their own research project under the supervision of Nick Smith and members of the Smith lab. Projects may involve, but are not limited to, laboratory, greenhouse, field, and/or computer simulations. Ideally, projects will follow from a proposal developed in a previous semester. Offered every semester. This course is ideal for students that have either taken 4100 or have extensive training in botany, ecology, computer science, and/or statistics. Spring 2018 Syllabus.